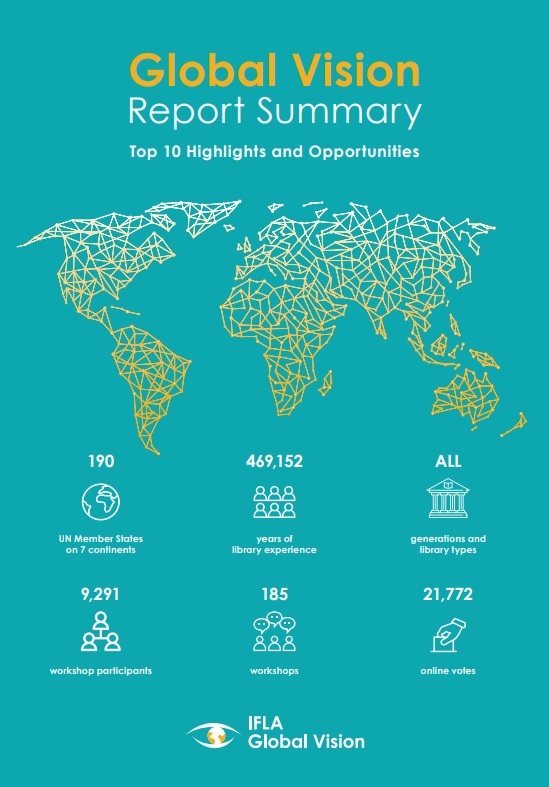 IFLA’s eagerly-awaited Global Vision Report Summary reveals incredible insights into the views of over 31,000 participants from 213 countries and territories and across all seven continents. Overwhelmingly, the most important key finding from the global vision discussion is the discovery that we are globally united in our goals. Across regions, library types and length of engagement with libraries, we share a deep commitment to the enduring value and role of libraries. This gives us a strong foundation in which to explore how a connected library field can meet the challenges of the future. Unveiled alongside this hugely positive key finding are the top 10 highlights and opportunities that now shape the 2nd phase of the IFLA Global Vision discussion, which asks the library field to build a vibrant ‘ideas store’ and explore how we can turn ideas into actions. For each Global Vision highlight there are also ten opportunities for action. And this is where the creative work begins!